For people with dementia and their caregivers, it can be difficult to find activities that strike the right balance between being supportive, being socially appropriate and, of course, being fun. As the disease progresses and abilities change, it’s common for friends to withdraw and activities to start to fall away. A person is left with few things that can offer joy, a sense of purpose and human connection. I’ve seen this firsthand—my father had dementia for 18 years. As it progressed, I watched him and my mother (his caregiver) become increasingly isolated. Despite that, he always enjoyed one of his favourite activities: singing and listening to music. So, when the opportunity arose to create a choir for people with dementia, I was in. I remembered my father and his passion for music, and I imagined a community of voices that could support people like him. And so, Voices in Motion was born. 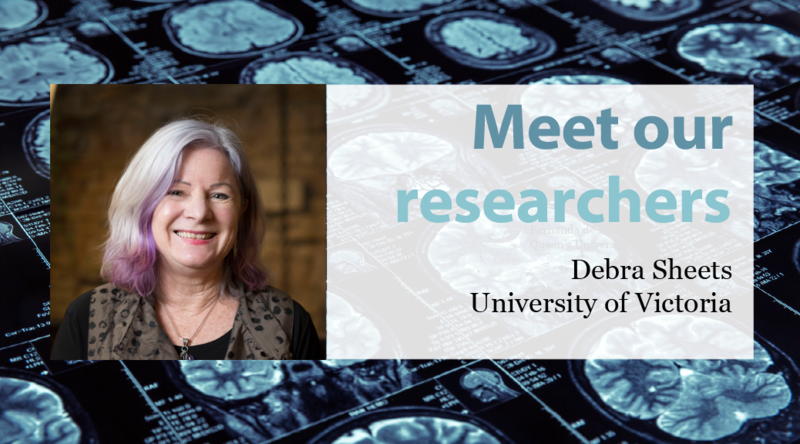 Video: Dr. Debra Sheets, Associate Professor in the School of Nursing at the University of Victoria, talks about her research on the benefits of an intergenerational choir for people with dementia. Dr. Sheets received a Quality of Life Grant from the Alzheimer Society Research Program (ASRP) 2017 competition. The project is jointly funded by the ASRP and the Pacific Alzheimer Research Foundation (PARF). Voices in Motion is an intergenerational choir that brings together people with Alzheimer’s disease, caregivers and high school students from the community here in Victoria, B.C.. Through this program, my research team is studying the impact of the choir on the quality of life and well-being of people with Alzheimer’s disease and their family caregivers. We hope that this project will be a supportive activity that reduces isolation and brings joy and creativity back into the lives of caregivers and people with Alzheimer’s. The benefits of music and the arts for people with dementia are well-known, and anecdotal evidence has shown choirs to be particularly promising. But what we don’t know—and what we hope to learn through this study—is how all of these benefits are realized, and the best way to design and implement such a program. That’s why, with the findings from this study, we’ll create a toolkit of best practices that can be used by other organizations who are interested in starting a community choir for people with dementia. We hope that this research will lead to the development of similar choirs for people with dementia as well as those living with other forms of disability. I’m excited about this research and I look forward to sharing the results. What are the benefits of an intergenerational choir? Singing is a joyous activity, and a choir is a natural way for people to develop a sense of community. By integrating social, mental and physical activity, choirs can help reduce symptoms, improve mood, and increase connectedness. By shifting attention away from disease-related declines and losses, choirs can boost self-esteem and confidence…and give those living with the disease a voice and visibility in their community which may otherwise be lost! The opportunity for respite and to connect with other caregivers living similar experiences. Reduced stress and feelings of burden and greater overall well-being. Opportunity to gain volunteer experience. Better understanding of Alzheimer’s disease, its symptoms and its challenges. Greater understanding of the valuable contributions people with Alzheimer’s can make within their community. By delaying the onset of more debilitating symptoms and delaying admission into residential care, programs such as Voices in Motion could contribute to reduced health care costs.